Provide your customers with a real-time support and a better chat experience. Tagging is a powerful way of organizing your data in a way that can be quickly and easily isolated. 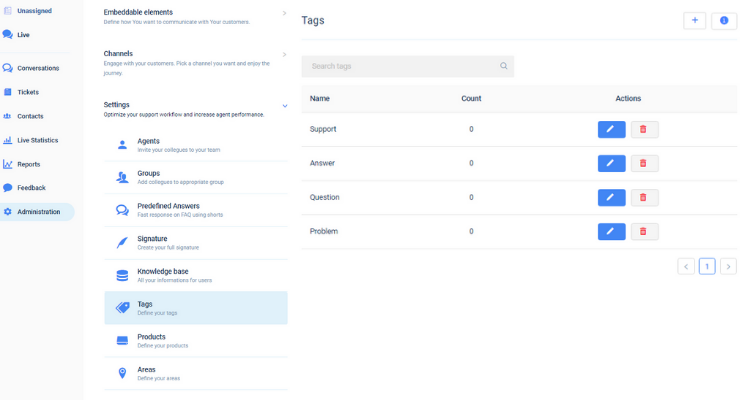 Using tags, you can load your tickets with additional data and keep track of certain topics in your helpdesk. Tags can be applied to conversations and customer. Each tag denotes the number of tickets and contacts associated with the respective tag. In order to access them, go in Administration and under Settings click on Tags. You can add a new tag by clicking ‘+’ button in the upper right corner. Enter your desired tag name and click on ‘Add’ to finish adding your new tag. ‘Count’ represents the number of times that a certain tag has been used in tickets. Manage your tags. You can edit/delete tags by clicking on the respective actions.